Jan Molby has possession in midfield for Liverpool. The ball at his feet he looks up, sees Ronnie Whelan breaking forward and plays the perfect pass into the space in front of him. The game has become a little stretched, Everton are searching for an equaliser and gaps are appearing in their defence. Whelan runs on to Molby’s pass and drives forward towards the edge of the Everton penalty area. Kenny Dalglish makes a run across his path into space, the Blue defenders aren’t sure what to do or who to mark, they’re back-pedalling now. Whelan uses King Kenny’s run as a dummy and clips an exquisite ball over the Everton defenders into the path of Ian Rush who is hurtling into the box. Everton fans start to grimace, Reds fans sense a goal. Rush, from the angle of the six-yard area, wallops the ball past Bobby Mimms into the far corner of the goal. The net bulges and in doing so knocks over a camera placed there by a photographer hoping to get a shot of the winning goal in the 1986 FA Cup final. 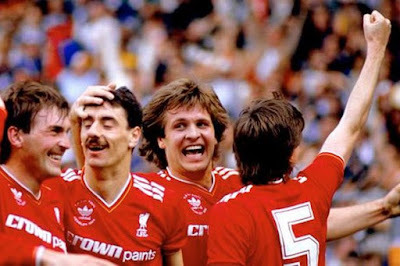 The camera somersaults backwards a few yards from the power of Rushie’s right-foot shot and lands with (possible broken) lens pointing skywards. Who knows if they got the picture they were after? That makes it 3-1 to the Reds. 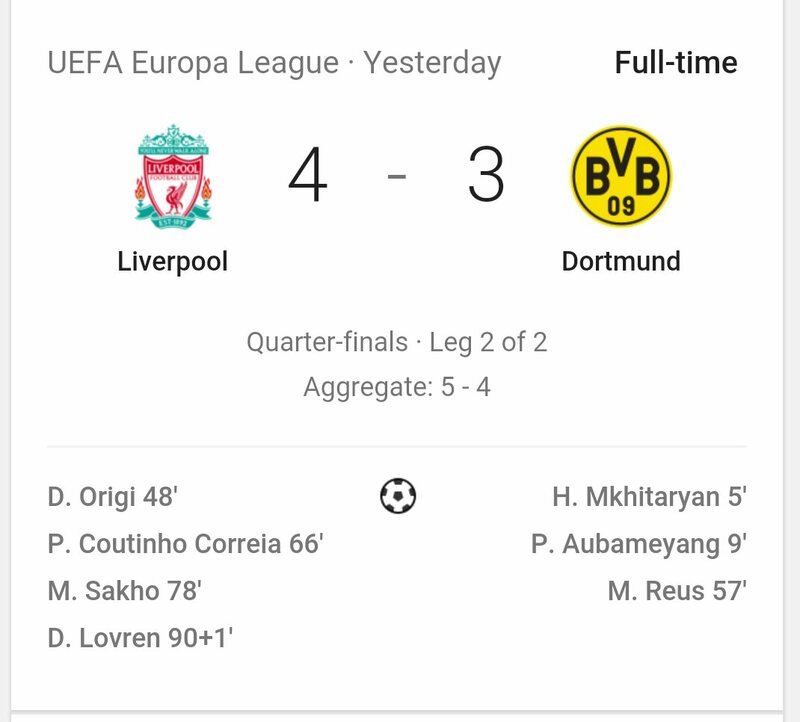 Liverpool see out the game to win by two goals and, with the League title already wrapped up, complete the first League and FA Cup double in the club's history. Where I’m from you’re either one or the other. 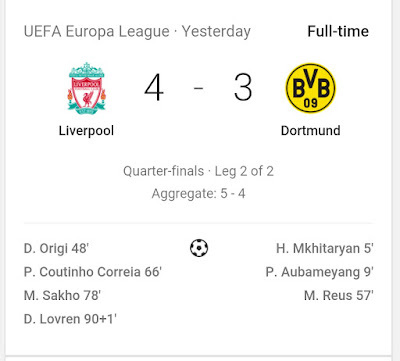 Liverpool or Everton. Red or blue. Me? I’m completely Red and became so the precise moment Ian Rush sent that camera cart-wheeling across the Wembley turf when I was 9 years old. I still wear my 1992 centenary edition kit when I occasionally run out for a game of five-a-side. Since those footy mad school days my interest in football has waned a little, due mainly to the effects of all the money sloshing around the modern game. It has spawned the arrogance and disloyalty that curses many of today’s overpaid, over-hyped, under-performing and under-talented players. Players that are more concerned with image rights, WAGS and sports cars than providing trophies for fans. These days football fans are constantly milked for hard earned cash so the super-rich can turn a profit from the clubs they are buying up with a voracious appetite. … remind me why; a passion and adventure that no other club can come close to matching, but now my biggest buzz comes from capturing images of wild things in wild places. Red Knots roost on the rocky reefs and sand banks of the fjord. They are fast asleep and out of range of my camera and telescope. I have bagged a few hundred pictures of them in their bright red summer plumage and recorded plenty of data for our colour ringing project but, at high tide, there is a lull in Knot activity. It is now that things turn, momentarily, from red to blue. Among the more polite but still derogatory terms that Liverpool supporters have for their rival Everton fans is the term “Bluenose”. 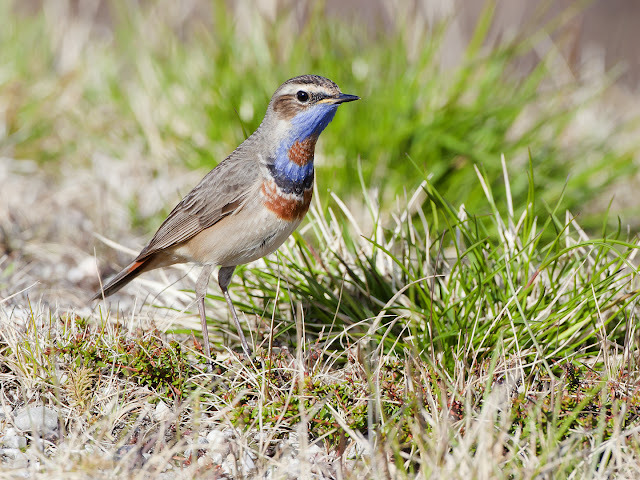 There are no Bluenoses in Lille Porsanger but there are Bluethroats. I hear a call that I am not familiar with. It is in part melodic, partly scratchy buzz, quite unique. I have a little think as to what it could be. 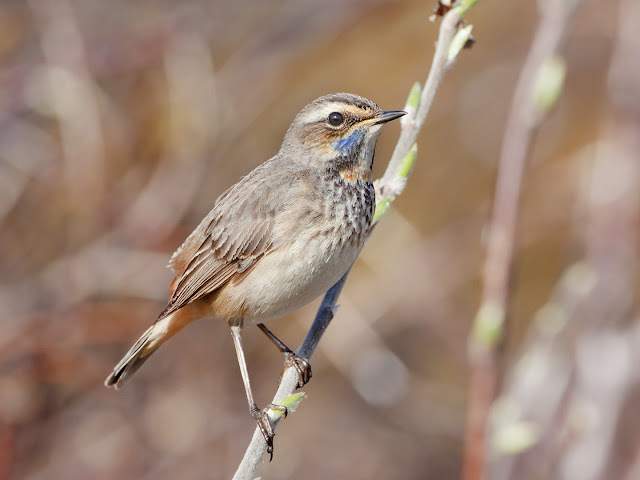 The list of suspects is not long and I decide it is probably Bluethroat. I scan the tops of the bursting birches at the side of the road. 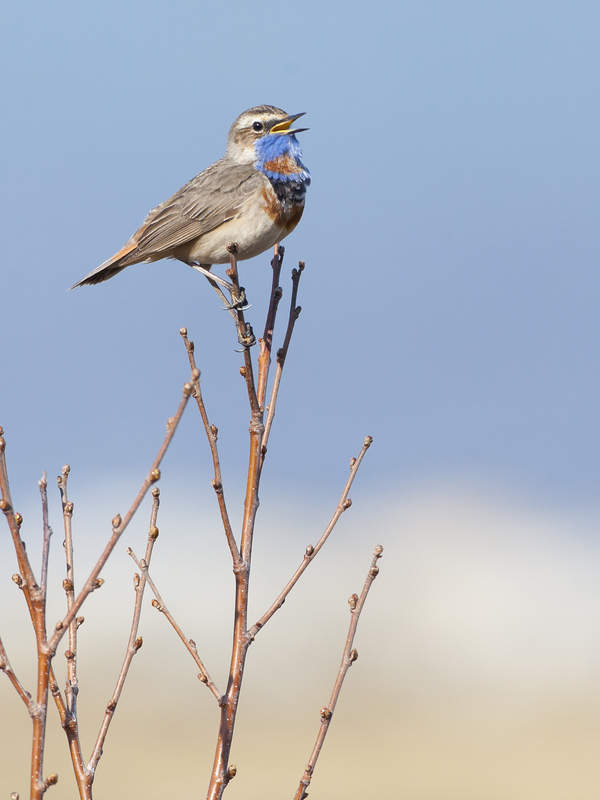 My suspicions are confirmed when I see a male singing his song from atop a tall-ish tree. I wait a while, listening to the call and watching him flit from branch to branch. Soon he drops to the floor and starts to feed amongst the sparse vegetation of the gravely roadside verge. The sun is shining again and I step from the shade of the hire car into the light. To get a better angle I lie on the tarmac, it feels surprisingly warm. 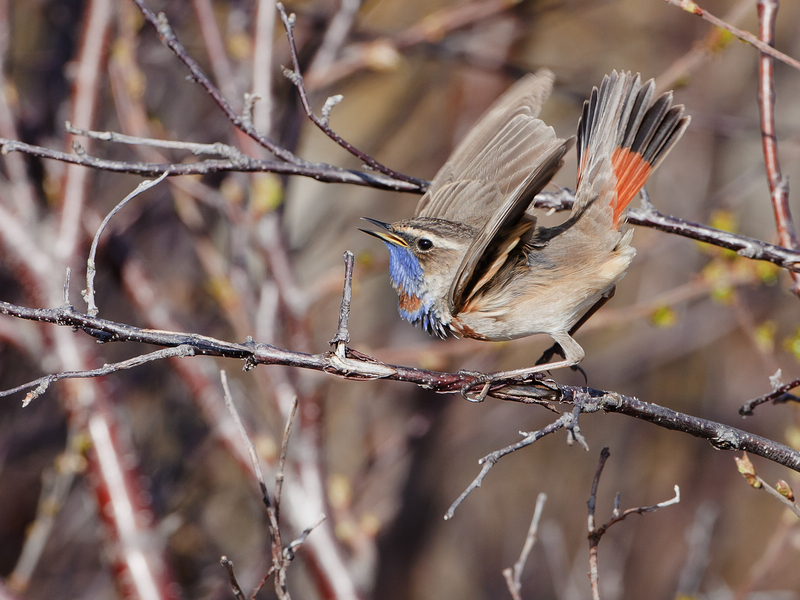 The Bluethroat hops closer. The road to Veidnes is a quiet one so I’m happy to lie on it for a while, I don’t fear getting run over or scaring an approaching motorist by being prone and motionless on a road by a seemingly abandoned vehicle. The Bluethroat hops to a perch on the mountains side of the road, backlit by the burning sun. Before swiftly switching to a sunny perch on the fjord side. His singing seems to pay off as a female appears from nowhere in a low scrubby birch just to my left, his right. She is more subtly marked than he is; her collar and bid not as brightly marked or extensive as his. 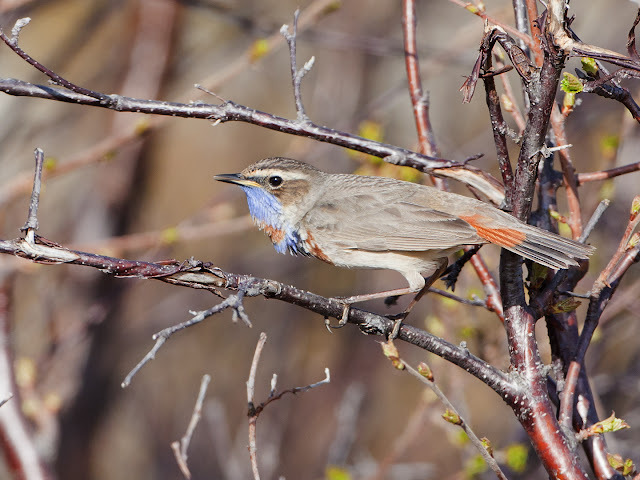 She is unmistakably Bluethroat though. 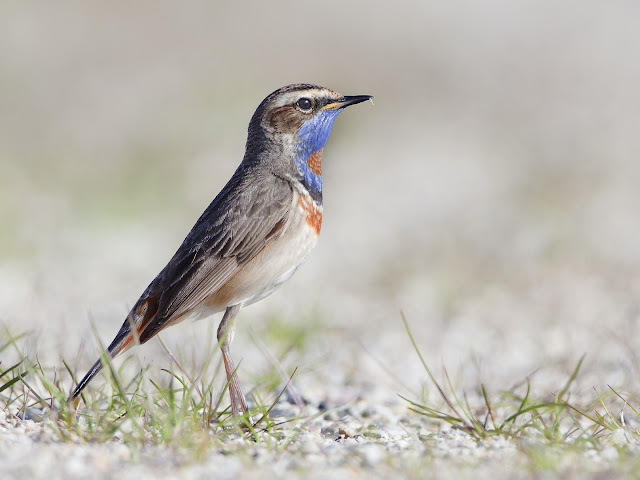 The male and female plumages do not differ like a home and away footy kit do. He wastes no time, straight into full on display mode. The song is ramped up to maximum volume and he pulls out his best moves. 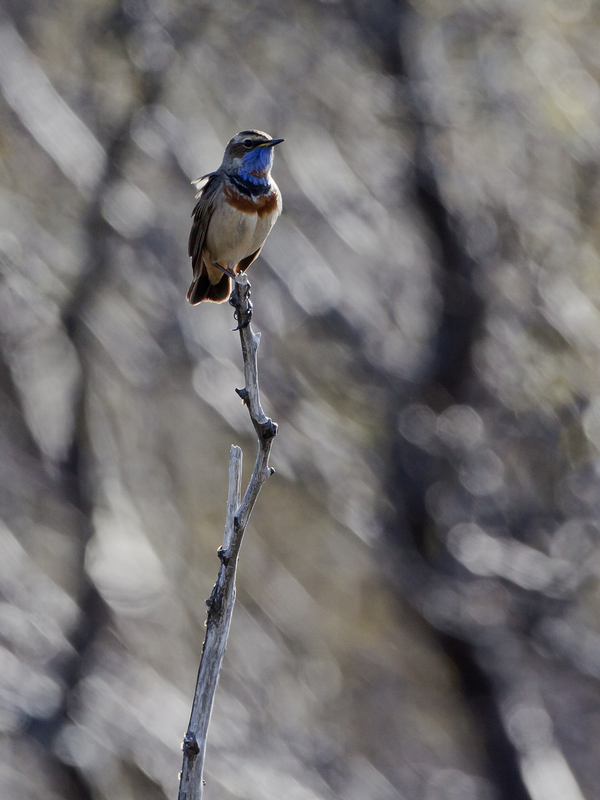 His blue throat patch shines with a metallic iridescence in the afternoon sun. He flashes orangey red tail feathers in her direction and wiggles his wings, his song becomes quite shrill, he’s obviously pulling out all the stops. She flies off. He resumes singing his song, his chant, the Bluethroat’s own terrace anthem. She doesn’t reappear so he goes back to feeding on the roadside verge. Looks like he’s missed out. The Blues get that losing feeling again. I reel off some more pictures as he darts and scurries in amongst the grass, hunting the bugs and beetles emerging at the start of the brief but spectacular Arctic summer. 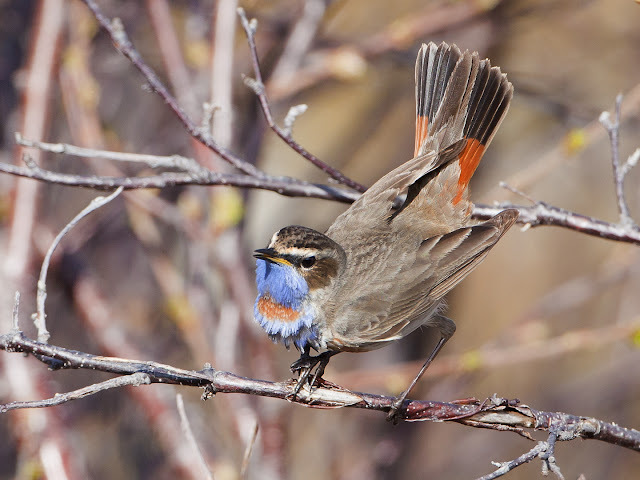 Bluethroat on my Patch would be a real rarity so it's ace to get close to this individual and take his picture. 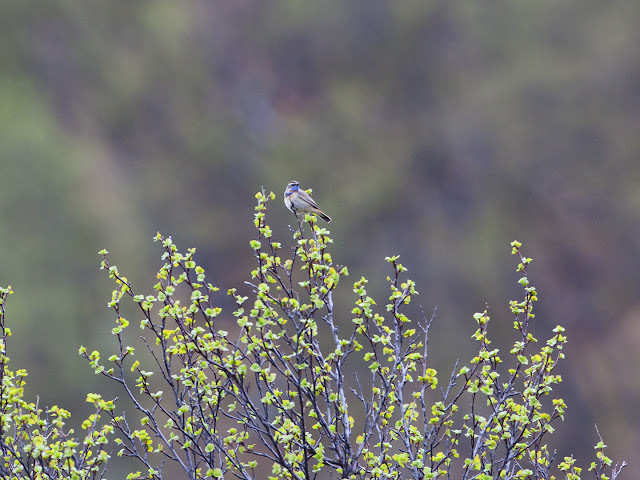 I shoot away until a car speeds by and spooks him back to the birch tops. I look at my watch, a little over an hour has passed and the tide has dropped enough for the Knots to wake up and fly to the refreshed flats to have a feed. They are back in range for a bit of colour ring data collection. The Blue diversion is at an end, the Reds are on the march. I pack away the camera and go looking for Red Knot.